The United Nations has proclaimed 2019 as the International Year of the Periodic Table. The periodic table is more than just a list of known elements, it is a powerful tool that helps scientists predict and understand the properties of matter throughout the universe. So why 2019? For starters, this year marks the 100th anniversary of the International Union of Pure and Applied Chemistry (IUPAC). The group was founded in 1919 to establish international standards for chemistry and address global chemistry issues. Some of IUPAC’s responsibilities include setting the rules for naming new chemical elements on the periodic table and standardizing methods to measure their atomic weight. This year also happens to be the 150th anniversary of Russian chemist Dmitry Mendeleev’s discovery of the periodic table in February of 1869. While Mendeleev’s table is the basis for the modern periodic table, he was not the first to investigate patterns in the arrangement of the elements. In 1862, French geologist Alexandre-Émile Béguyer de Chancourtois first arranged the elements by atomic weight, showing that similar elements appeared every so often. In 1865, British chemist John Newlands developed the “Law of Octaves,” noting that elements arranged by atomic weight have similar physical and chemical properties in intervals of seven. In 1868, German chemist Julius Lothar Meyer arranged elements into families of similar elements with the same valency (how many other atoms they can combine with). Mendeleev’s periodic table featured similar arrangements, but with two key differences. First, he rearranged elements to fit into families even if they were no longer perfectly arranged by atomic weight. We now order elements by atomic number (the number of protons an element contains), which usually increases as atomic weight does, but with a few exceptions. An even more profound difference is that Mendeleev left gaps in his table for undiscovered elements, allowing him to use trends in the table to accurately predict the existence and properties of missing elements. While only 63 elements were known in Mendeleev’s time, today’s periodic table contains 118 elements. Four of them were just added in 2016: Nihonium (113), Moscovium (115), Tennessine (117), and Oganesson (118). Elements heavier than Uranium (92) do not occur naturally on Earth and must be created in a lab. These “superheavy” elements are highly unstable and only exist for a few fractions of a second. Scientists are working on creating elements even heavier than Oganesson, but it is unclear if they will last long enough to be detected. Will more elements be added to the periodic table in the next 150 years? Only time will tell! 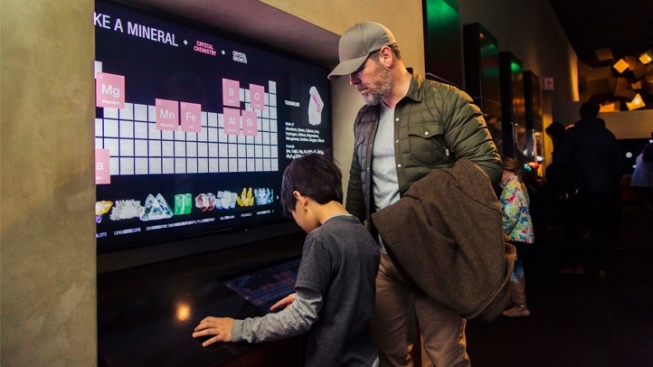 Visit the Perot Museum to learn more about the periodic table, including the elemental makeup of the breathtaking specimens displayed in the newly remodeled Lyda Hill Gems and Minerals Hall. Learn more at www.perotmuseum.org.